Metallica’s “Hardwired…To Self-Destruct” has dominated the year-end rock charts in the US. According to Billboard, the veteran metal band’s tenth release landed at No. 1 on their Top Rock Albums and Hard Rock Albums rankings. Released late last year, “Hardwired…” sold 1.1 million units in the US in 2017, making it the only rock album to top 800,000 units. The set debuted at No. 1 on the US Billboard 200 with opening week sales of 291,000 equivalent album units to deliver the group their sixth US chart-topper. Metallica also came in at No. 2 on the Mainstream Rock Artists chart for 2017 and at No. 4 on the year-end Top Rock Artists recap. “Hardwired…” recently delivered the band a pair of nominations for honors at the 60th annual Grammy Awards in January. In the running for “Best Rock Album” of the year, the project goes up against releases by Mastodon, Nothing More, Queens Of The Stone Age and The War On Drugs. The track, “Atlas, Rise!”, has been recognized as a finalist in the “Best Rock Song” category alongside tunes by the Foo Fighters, Avenged Sevenfold, Nothing More and K. Flay. 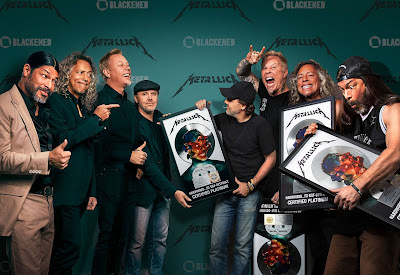 The latest recognition marks Metallica’s 22nd and 23rd Grammy nominations; the band have won nine times since 1989. Metallica recently headlined a benefit concert at San Francisco's AT&T Park for those affected by the wildfires in California, and will return to live action with a spring 2018 run across Europe that will begin in Lisbon, Portugal on February 1.